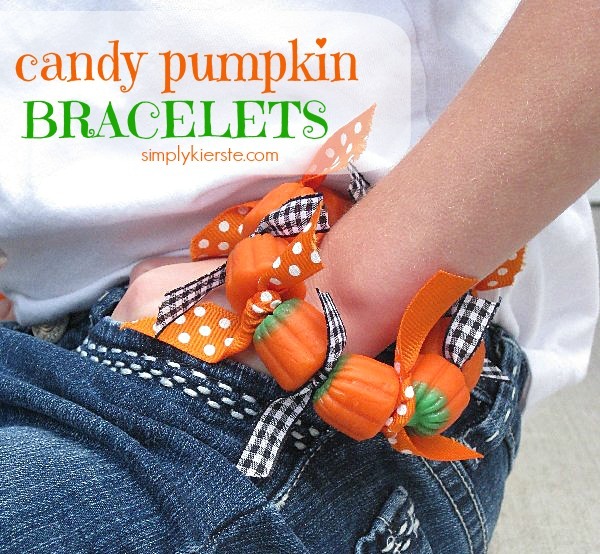 I was shopping last weekend, and saw the most adorable pumpkin bracelet in one of my favorite children’s stores. 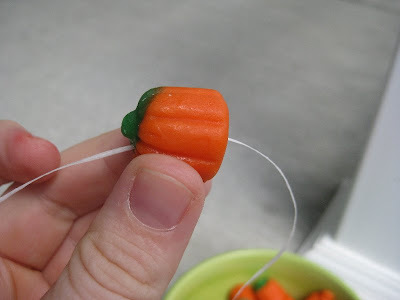 I had to come home and try it, but in this super fun, candy pumpkin version. 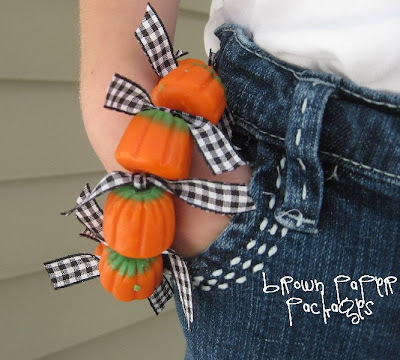 I love the way these Candy Pumpkin Bracelets turned out!! These would be the perfect addition to any Halloween party–as a favor, or as a craft. It’s also a really fun activity to do with your kids at home, and my girls loved to help. They are simple to make, and really inexpensive, making it easy to make a bunch, or just one! 1. Cut off a long piece of floss. You will trim it later, but you want plenty to work with. I used white floss, but it doesn’t really matter, since it will be completely covered. 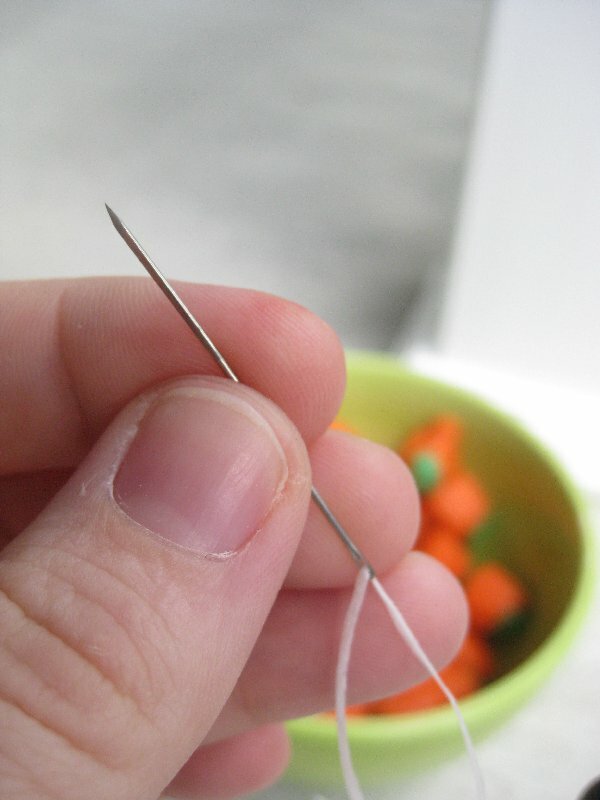 Thread it through your needle, just enough to get it through, plus a little bit. 2. 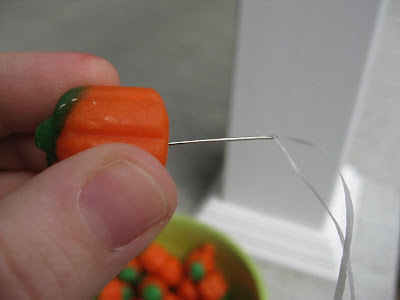 Poke your needle into the bottom of the first pumpkin, and push it through the top. You will definitely need something to help push it through–your finger alone will not be strong enough. I used the dental floss case as leverage, and it worked perfectly. 3. Repeat this process, until you have enough pumpkins to completely circle wrist, and have a little bit of wiggle room. My girls are 4 years old, and I used 9 pumpkins on each of their bracelets. 4. Once you have the desired amount of pumpkins, tie your two ends of floss together to make a bracelet, then trim the ends. 5. Tie short pieces of ribbon in between the pumpkins. I made one bracelet with all black gingham ribbon, and the other I alternated the black gingham and an orange polka dot. Your blog is lovely. I look forward to coming back and catching up with older posts. I loved this when I saw it yesterday. So cute. Something a little girl (or big girl) would love to wear! Super cute – I'm so making these for my neighbors! how ADORABLE! i saw this yeasterday and just loved it! how creative:) my girls will love making these, super festive! So cute! My daughter is going to love this! I love these! We are having a Halloween party this year and that would be a great little treat! Thanks for sharing! These are so cute. Thanks for sharing!! You are totally to blame for this preggo's craving for pumpkins!!! Thanks a lot! Super cute and festive! 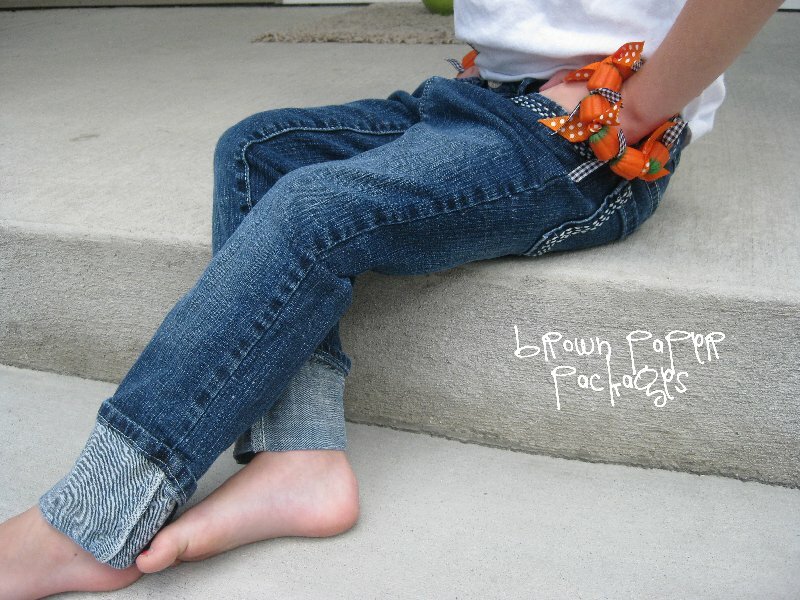 I just might have to find some little girls to make these for!! So cute Kierste… I love it. And where did you get your daughter's jeans? Simple and fun, it's great! The jeans are from the Gap Outlet–I bought them a couple of years ago. What size does S wear? My girls have just about outgrown them. This is adorable!! 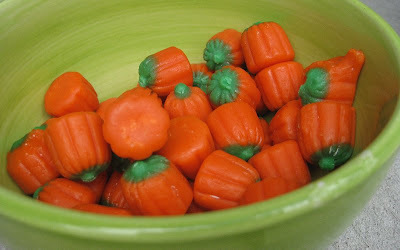 Although I don't know if I would ever be able to make one because I LOVE those little pumpkins. I would just end up eating them all!! So cute and simple. can't wait to make them with my girls! Love these!!! Have already been a copycat and made 3 ~ 2 more to go ~ for my granddaughters but now am wondering since there is no give, will they be able to get them off and on easily. I tried elastic thread but bad idea! Any help would be appreciated! Love your blog, too, and am making it a favorite (guess I mean I'll be following you). Have already bought my cheap liquid soap for my "boo" gifts, too! Keep the ideas coming!!!! Thanks so much for sharing this wonderful idea! I just made one for my daughter and plan to make some for her friends :) I posted it and linked back to your blog, hope you don't mind! Now that is a cute, fun, easy, adorable idea! So cute! I am sharing the link with my facebook friends. I just LOVE these! I am going to make one for each of the girls in my daughter's preschool class. Got any ideas on what I could do for the boys in the class? Love this! I finally bought the pumpkin candy tonight and not a moment too soon – we'll be meeting my kids and granddaughter at the pumpkin patch on Tuesday. Looking at the tutorial though I don't think I'll have a problem getting it done tomorrow. I love this idea! They are so cute, I had to give them a try, and shared your idea on my blog. Thanks!